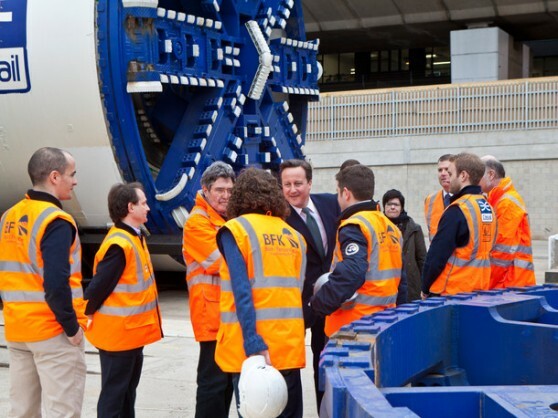 UK Prime Minister David Cameron visited Crossrail’s Westbourne Park site in west London to view the TBMs ahead of Crossrail tunnelling commencing next month. The Prime Minister was joined by Spanish Prime Minister Mariano Rajoy to meet engineers and construction workers and to hear more about tunnelling preparations for Europe’s largest civil engineering project. Construction of Crossrail’s western tunnels between Royal Oak and Farringdon is being undertaken by a UK joint venture comprising BAM Nuttal- Kier Construction- Ferrovial Agroman – the UK subsidiary of Spanish multinational Ferrovial. Next month, the first TBM will be launched into one of the twin bores at Royal Oak Portal tunnelling east towards Farringdon. A second TBM will subsequently be launched in April through the second bore. At over 140m long and weighing around 1,000 tonnes the TBMs will travel 6.4km eastbound under London via Paddington, Bond Street and Tottenham Court Road before reaching Farringdon in 2013. This will be followed later this year by the launch of a further two TBMs from Limmo Peninsular in the Royal Docks that will travel a total of 8.3km towards Farringdon via Canary Wharf, Whitechapel and Liverpool Street. Construction of the concrete segment factory for the western running tunnels between Royal Oak and Farringdon is now complete at Old Oak Common. The plant has begun manufacturing the 75,000 segments that will be required for the western tunnels. A total of eight TBMs will construct 21km of new twin-bore tunnels (42km in total).